I like coming up with recipes that my kids can make. This way, I can sit down and read the paper while they “cook” their breakfast or snack. 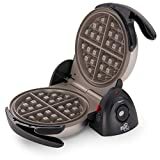 A waffle iron is the perfect appliance for children to cook with because it is so contained. Adults and college students like waffle irons because you only have to clean one thing (the waffle iron - instead of two things - a pot and a stove). Frozen shredded potatoes (also known as hash brown potatoes) can be found new to the French fries in the frozen section. There is nothing added to them - they are simply potatoes sliced for your convenience. 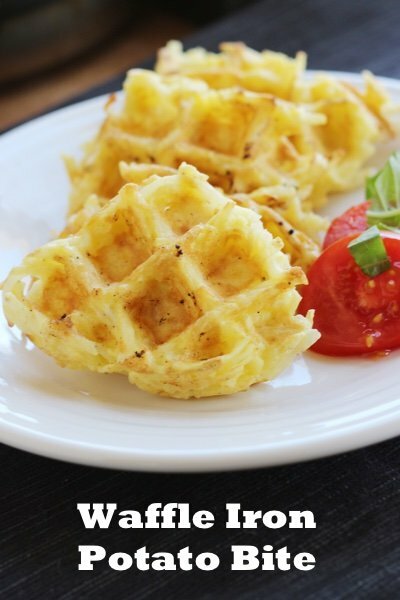 These waffle potato bites are a great snack and much healthier than potato chips. You get your CRUNCH without all the salt and oil of the chip. Do you cook with your waffle iron? Heat waffle iron and spray with non-stick spray. Beat egg in a small bowl and mix in potatoes. Spoon mixture in 4 spots on waffle iron and sprinkle with salt and pepper. Cook for four minutes until crispy. Serve immediately. Lisa what a clever idea!!! Ore-Ida contains: Potatoes, Dextrose (Sugar), and Disodium Dihydrogen Pyrophosphate. Innocent-sounding Simply Potatoes brand contains: Potatoes, Dextrose (Sugar), Disodium Pyrophosphate, Potassium Sorbate, and Sodium Bisulfate. Alexia and Cascadian Farms potatoes are virtuous, yet costly. what brand did you use, Lisa, that are just potatoes? I can't wait to try this with my grandchildren, they are going to love the idea of making it themselves. Fun day! What could I use in place of egg as a binder? One of my sons has an egg allergy but these look delicious and I'd love to make them! I have been wanting a waffle iron forever now. 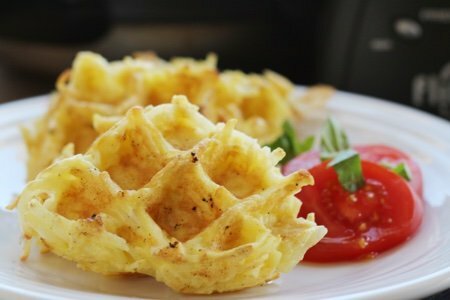 Those look great you could make an entire breakfast in the waffle if you wanted to. You sold me on 'crispy"! Could these be pre-made and warmed up? I'm thinking my daughter would love them but she doesn't have a lot of time in the morning to make them. Any suggestions? apples - thanks to your great post about waffle-cooked apples. They are out of this world, so sweet! These look good, but could I shred my own potatoes in my food processor or are the frozen shredded potatoes precooked? Thanks! What brand did you use? I would like to give these a try. Try the George Forman grill, just like a waffle iron. I used the food processor to shred raw potato, some salt and pepper, and they were crispy, crunchy, delicious. I used the store brand - Stop & Shop shredded potatoes and it did have some preservatives added BUT I feel like those are in very small amounts so I am not worried about it. Alternatively, you could grate a fresh potato on a grater. I meant that they hadn't added fat or salt to the shredded potatoes. These can be premade and warmed up BUT they might not be as crispy. You could hold these together with cheese instead of eggs - though they would go up in calories. Thanks for all your wonderful questions and comments! Would this work with freshly grated sweet potatoes? Much healthier alternative! Trader Joe's shredded hash browns are preservative-free. Is 1 Weight Watchers point the whole waffle or just one of the four waffle segments?